touring and playing with "The Irish Rovers" band. Fred appears as a drummer in the feature film, Brooklyn. Watch for him during the dance hall scene when you go to see the film. In the trailer, he appears, way in the back, at 56 seconds. To listen to Fred Graham's interview on the Own Your Creativity podcast, click on the player below. 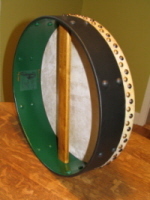 _Two sizes of bodhran are offered: 16-inch and 18-inch diameter. The skin is normally premier quality goatskin, but calfskin (vellum) can be supplied on special order. The shell is a poplar laminate of a 5/16-inch wall thickness, with a birch veneer outer surface. 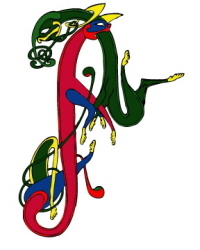 The inner surface is painted green, while the outer is stained golden oak. Plus, the shell is re-inforced under the goatskin by another laminate ring. 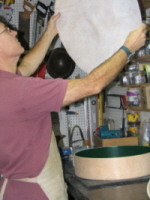 All instruments have one fixed maple strut (½-inch thick by 1½-inch wide), and it is stained to match the shell. 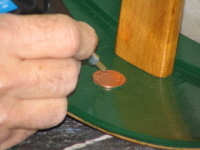 If required, a removable strut can be installed. _Each instrument is provided with a free-of-charge beater (cipin), made of maple or birch, weighing approximately 32 grams. 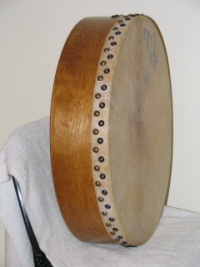 Also provided free-of-charge, is an introductory lesson on some fundamental rudiments, and basic “care & attention” for the bodhran. Please note that should a drum not be immediately available to satisfy your order, then production time is approximately 2 to 3 weeks. Bocote, Amarante, Bubinga, Palissande, Morado, Cocobolo, Pink Ivory, Padouk, Canary Wood, Zebrano. Custom woods and weights can be supplied upon request. Also available are wooden “bones,” and Cajons -- the percussion instrument of Peru. For more information, get in touch using the contact entry form.